Kwikset is a company built on the reputation of having secure locks that install quickly since 1946. In 2002, the Kwikset company introduced the Kwik-Install on many of their knobs and locks. This feature makes installation of the product even easier with its preinstalled screws. Kwikset knobs and locks come in a variety of styles to suit most decorative requirements while being both sturdy and functional. Replacing an old door handle with a new Kwikset that has the Kwik-Install feature can be done in less than an hour with basic household tools. Replace old or worn handles quickly with Kwik-Install handles. Remove the old or worn door handle. 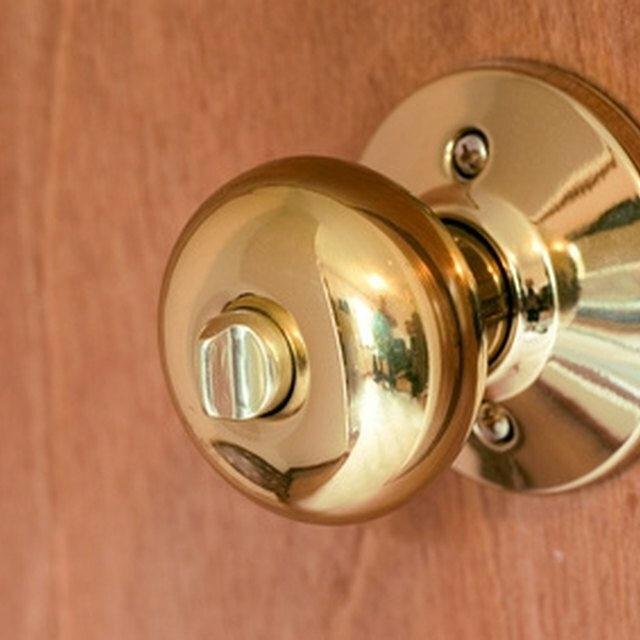 Usually, there are two screws on the inner door handle that need to be loosened. Once these are loose, or removed, depending on the type of handle, the basic assembly can be taken out. Slide the striker barrel out of the door. Remove the striker plate from the door frame. Slide the new striker barrel into the door. Make sure the slope of the tongue faces the door frame. This is what enables the door to be shut without having to turn the handle. Push the tongue in. This makes the holes line up so that the screws on the Kwik-Install handle can be slid into place. Use the half of the handle assembly that has the preinstalled screws, and slide it into place while pushing in on the tongue. Release the tongue. Line up the mounting holes on the other half of the assembly with the screws on the first half. There is a larger hole that the screw head fits through with a smaller opening attached to it. Place the larger holes over the screw heads and twist the assembly so that the screws are in the smaller openings. Use the screwdriver and tighten the screws. Install the new striker plate onto the door frame with the included hardware. Test the handle mechanism.